so this item do come with a skimmer? Thanks for providing me with more details! The Hydra Nano Plus comes with several fittings that lets you decide how you use it, either with the surface skimmer, with a venturi and whether you want the water outlet to be under or above water level. It's really flexible to your needs. Hi i am using a 5.5 by 2 by 2 feet tank, which hydra model should i get for my tank? 1. What fishes are you keeping? 2. Will the Hydra be the only filter or complementary filter to your current filtration? If complementary, which filter are you currently running? Aquascapen.nl (based in The Netherlands) reviews the Hydra Nano Plus! Find out more about what they have to say about the Hydra Nano Plus! "Hydra is a word that is becoming increasingly common in the aquarium world. However we do not refer to the little bug that can be in your aquarium, but the new filters by OF Ocean Free. This new line of filters introduced Hydro-Pure Technology to the market and might be the start of a new revolution in aquarium. We tested the Hydra Nano Plus, the filter / skimmer combo by Ocean Free (OF). Filtering can be done in several ways. Mechanically; by means of sponges, biologically; by means of bio media and bacteria, and finally chemically; with the aid of for example active carbon. The Hydra Nano Plus focuses especially on the last part. Through a sponge filter and patented OF Hydro-Pure Technology introduces a whole new way of filtration to the market. The Hydra Nano Plus feels sturdy and is made of thick plastic. Also the extra parts do not feel cheap except for the skimmer cup. As it appears to be less finished at the bottom side. But since this is purely a technical component and it’s not visible this should not spoil the fun. The supplied air intake hose was not necessary in our opinion. It works in an aquarium but it harshly depends on the position of the filter and the waterline. When the Hydra Nano Plus is pushed further down, no more air is sucked into the tube and the air option becomes useless. Too bad, because that would have given this filter even more features on top of being a filter, skimmer and powerhead. For example, an L-number aquarium would benefit greatly from this oxygen supply. Regarding the surface skimmer function, it is perhaps best comparable to the Eheim skimmer 350, although it might not be completely fair. Whereas the Eheim skimmer 350 is really purely a surface skimmer, the Hydra Nano Plus is a full filter that features a surface skimmer. Hydra also qualitatively feels finer and easier to open. The Eheim skimmer does win ground on the size chart, as the Hydra nano plus is quite a bit bigger. 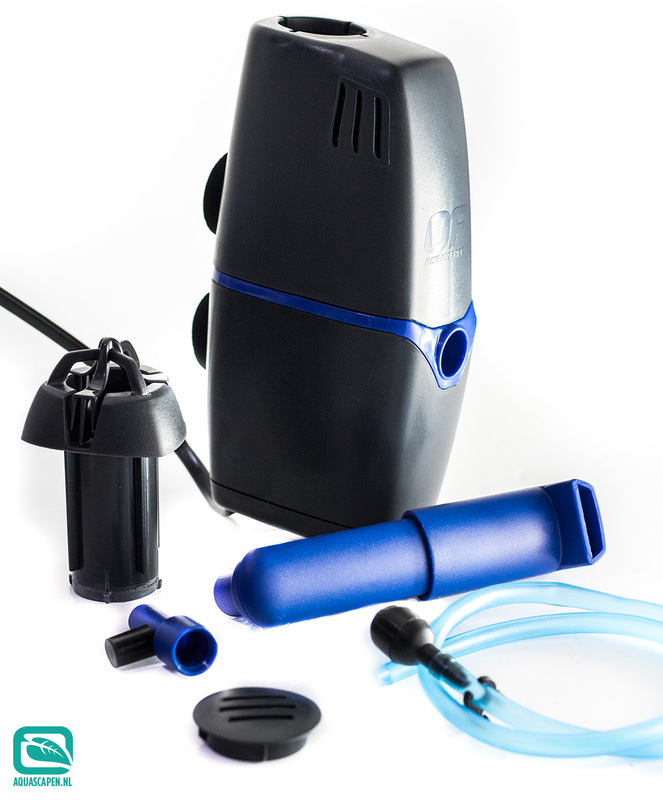 The Hydra Nano Plus comes with a distinctive blue outflow pipe. You can attach it to help direct the flow, but it’s completely optional. The main reason that this feature is incorporated, is to give it a double use as a filter in a turtle tank. You can position the filter flat in a shallow layer of water that is just high enough to cover the Hydra Nano Plus. The pump in the filter has enough strength to pump the water out of the blue outflow above the water. This gives a waterfall effect. Over the years new and advanced aquarium techniques such as the Twinstar entered the market. A product which has gotten high praise from aquascapers for its effect against algae. These products work on a principle of electrolysis involving the release of active oxygen. The end-product that is produced is called "Hydroxyl radical" or •OH. The Hydro-Pure Technology has the same kind of technology as the Twinstar and takes it one step further. Through a combination of electrolysis and their own Cata-pure media (a specially prepared activated carbon) most substances are bound and made harmless. An example of these substances are Ammonia (NH3) and nitrite (NO2). Saltwater aquarium owners might also like to know that it breaks down protein, which could make protein skimmers obsolete. Last but not least it breaks down sulphurous products, thus minimizing the chance of unpleasant odors. We have put the Hydro-pure Technology to the test by using it in an aquarium with several L-numbers. Often an aquarium which needs quite a few water changes. In this aquarium, the small Hydra Nano Plus outmatched the Ammonia and nitrite remaining on top of the 180-liter aquarium water quality. The filter ran in a planted tank for a while after that. Plants do well when using this product. Be warned though! Never use this product alongside a twinstar. The plants will die if you do this. We have learned this the hard way. The water is crystal clear when using this product and the water values are as you want them. As expected, there was no Nitrite and Ammonia to be found at all. Note here so though, there is a possibility that the Nitrate supply is reduced. If so find your plants a new source of nitrogen (N) and phosphorus (P). The Hydra Nano Plus offers a lot of options. From ordinary filtration to the use as a surface skimmer. It even supplies the option to use it in a turtle tank, the Hydra Nano Plus is a true multipurpose filter. With a price tag of around € 49.95, the filter is certainly not cheap. However, this filter offers more features than a standard filter. The possibility of skimming is perfect for aquascaper and gives the Eheim 350 certainly a formidable competitor in the freshwater aquarium market. We just hope the price tag will come down a little bit more towards the Eheim 350 skimmer. The product feels stronger in hand and not cheap. The cartridge should be good for a year of function. So on the price of replacing them it’s not that bad in comparison to competitive filter systems."